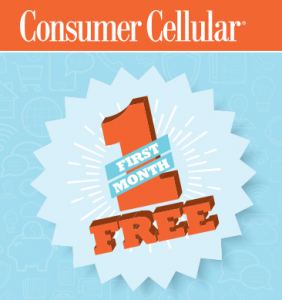 Consumer Cellular, one of the nation’s top prepaid MVNOs, has launched a new promotion that offers customers a free month of service when they sign up for a new line of service. The company, which uses AT&T’s network, is offering the promotion now through May 15, 2017. With the massive number of prepaid MVNOs and carrier options, it’s sometimes hard to keep track of it all and even harder to compare and decide which company is the right one for you. So, every Friday we’re going to go through and do a Face-off of two popular companies, comparing plans and services to help you better decide. 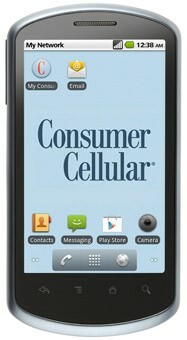 Today, we’ll look at Consumer Cellular, a popular AT&T MVNO, and Simple Mobile, a T-Mobile owned prepaid brand. 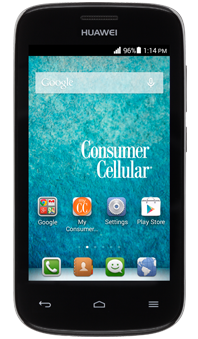 Consumer Cellular has added a new phone to its slightly limited phone lineup. 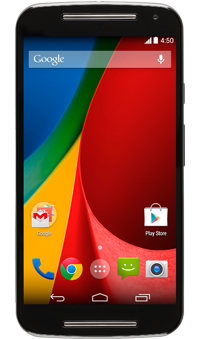 The most recent generation of the Moto E is priced affordably at $100 and while it doesn’t have top-of-the-line specs, it is still a pretty solid device that is sure to get the job done while looking pretty snappy. It is nowhere near uncommon for an MVNO to offer services from multiple Tier One carriers, and it seems that Consumer Cellular recently joined the list of MVNOs doing just that. According to an article I found on Prepaid Phone News, Consumer Cellular has added T-Mobile to their formerly AT&T-only offering, and customers who have better T-Mobile coverage in their area may receive a T-Mobile SIM when activating instead of an A&T SIM. Consumer Cellular, the no-contract, postpaid AT&T MVNO, has changed… well, everything. Literally every plan (with the exception of the $10 pay-per-use option) that Consumer Cellular offered has seen an increase without an increase in price. And, for the first time ever, unlimited options are finally available. It’s a huge step for this little MVNO. 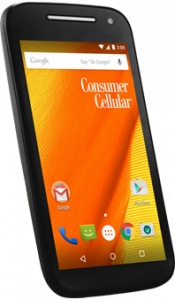 Consumer Cellular announced that they now carry the popular customizable Motorola Moto G EXT for $150 with no contract. This second generation Moto G was first released early last month and is the successor to one of Motorola’s most popular phones to date. Unfortunately, this device is not capable of picking up 4G LTE connections, so check your area and coverage before you buy. Consumer Cellular has announced that they are expanding their reach through a deal with Target. Starting this week, consumers will be able to purchase Consumer Cellular devices and services at more than 1,800 Target stores nationwide. Currently available in select Sears and Radioshack brick-and-mortar stores around the country, this partnership will be Consumer Cellular’s largest retail deal yet. Consumer Cellular has announced that they have expanded their phone lineup with two additional phones and changed their 30 day guarantee to better serve customers. The two new phones are both available today from the Consumer Cellular website and will be available through national retailers this month. The two new phones are the Huawei Ascend Mate 2 and the Huawei Vision 2, both of which offer excellent hardware, Android OS and an Easy Mode to make smartphone navigation simple and understandable for everyone. The traditional landline is all but obsolete, and now even modern VoIP home phone lines are being challenged. While they still present the best option for many families, others simply don’t use the home phone enough to justify the monthly cost of VoIP service. For them, home phone service from a cellular provider might make sense. Last year Straight Talk announced and then launched a home phone service that costs $15 per month. Yesterday Consumer Cellular announced its own in-home phone service. It includes a phone device, dubbed Wireless Home Phone Device, which costs $35. It works anywhere you have an electrical outlet and Consumer Cellular service. The service itself costs $10 per month when added to a Consumer Cellular account. And yes, you can use your current home phone number with it. You can sign up for the service at Consumer Cellular’s website. 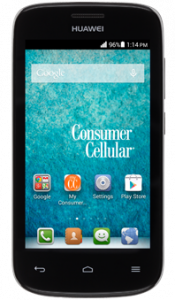 We’ve grown used to seeing Consumer Cellular adding Android handsets to its lineup lately, making them more appealing to a wider audience. But at its core, Consumer Cellular is about simplicity. They’ve traveled down that path again, adding the Doro PhoneEasy 618 to their lineup. As you can gather from the picture above, it’s the most basic of basic phones. It does have a 3.2-megapixel camera, nice for taking mid-level pictures from a flip phone, but that’s about it. The emergency call button, however, does add appeal to this phone for Consumer Cellular’s core of senior users. The phone is available now at Consumer Cellular’s website for $60. Consumer Cellular has announced changes to its monthly rate plans that will provide customers with more minutes and messages for the same monthly price. The $15, $20, and $30 plans get 50 additional minutes. The $40 plan gets 300 additional minutes, while the $50 plan gets just 200. 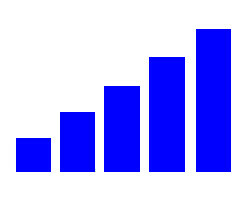 The $60 plan gains the most, with a 1,600-minute increase. The Connect! Complete messaging plan now includes 4,000 messages and 400MB of data, while the Connect! Max doubles to 10,000 messages and 1GB of data. More information on the plan increases is available at Consumer Cellular’s website. If the above-pictured smartphone looks familiar, it’s because we saw it not too long ago. Back in March AT&T GoPhone got the Huawei Fusion, a bare bones Android smartphone. Now Consumer Cellular has picked up the same smartphone, though it goes by its call numbers 8652. It runs Android 2.3 and has a 3.5-inch screen, so it’s not anything that people will line up to buy. But its a decent handset for the price of $100, contract-free. You can grab the Huawei 8652 at Consumer Cellular’s website. We’ve seen Consumer Cellular come on strong with Android handsets lately, but that doesn’t mean they’re neglecting their feature phone lineup. Late last week they announced two new feature phones, the Motorolas WX416 adn EX430. The WX416 is your most basic of basic flip phones, with dual monochrome displays. It runs $35. 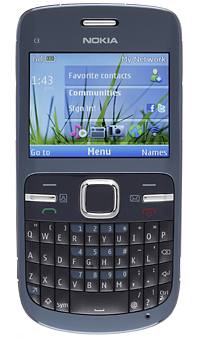 The EX430 is a BlackBerry-looking QWERTY phone with a small screen (240 x 320 pixels). It runs $85. These are nothing special, but they’re decent options for those who don’t need smartphones. You can get either of them at Consumer Cellular’s website. It’s been a while since Consumer Cellular has added an Android handset. Last year they debuted their first one, the Motorola Bravo, but we hadn’t seen any since. That is, until this week. The carrier has released the Huawei 8800, which is a bit higher end than the Bravo. It features a 3.8-inch touchscreen, so it’s slightly larger than the iPhone, though the resolution is only OK at 480 x 800. While there’s no indicator, I’m sure this runs Android 2.3 and won’t get an upgrade to 4.0, but I’m also not sure that Consumer Cellular customers much care. 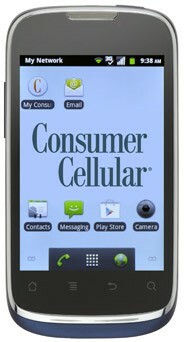 The 8800 costs $175 and is available now from Consumer Cellular’s website. One cost that many people do not factor into their cell phone purchases is the activation fee. Some carriers simply do not charge one, while others do, so a degree of research is required. Starting now you can add Consumer Cellular to the list of carriers that does not charge an activation fee. They just eliminated those charges, which takes $35 off the total price for new customers, as well as current customers activating a new phone. Consumer Cellular recently announced a number of package deals that include web and messaging features. There are five in total. The Lite package contains 100 messages and 10MB of web for $2.50 per month. The Ready package has 500 minutes and 50MB for $5 per month. The Active plan contains 1,000 minutes and 100MB of data for $10 per month. The Complete package has 2,500 messages and 250MB of data for $20 per month, and the Max plan has 5,000 messages and 500MB of data for $30 per month. Consumer Cellular customers can upgrade to one of these plans at Consumer Cellular’s website. Consumer Cellular recently announced upgrades to its Connect! plans, which add messaging and data options to their monthly voice plans. Many of these plans include double the original data for the same price, making their Connect! plans even more attractive. This will go over particularly well with customers who have purchased, or plan to purchase, the Motorola Bravo, Consumer Cellular’s first Android handset. After the break we’ll break down the new plan details. 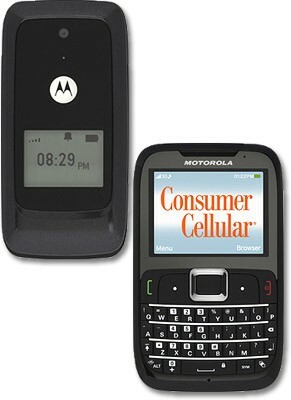 Yesterday Consumer Cellular announced the release of the Motorola Bravo. It’s their first Android handset, and it’s a decent offering at that. 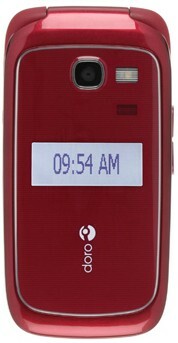 The Bravo features a 3.7-inch touchscreen and runs Android 2.2. It also comes with Swype, which is useful for people who aren’t used to typing without a physical keyboard. Consumer Cellular is highlighting its most expensive data plan, which includes 2,000 minutes and 100MB of data, for this handset. Customers who order the Bravo will instead get 200MB of data with that plan, which costs $20 per month on top of a standard voice plan. You can get the Bravo for $165 at Consumer Cellular’s website. One of the keys for prepaid companies, and specifically MVNOs, is to gain distribution at retail outlets. Online store are fine and good, but smaller carriers need that physical retail presence to keep their names out there. Consumer Cellular just gained one of those distribution deals. It’s with Sears, and it gives them access to 800 outlets across the country. Only a limited number of handsets will be solid in these stores, including the Motorola WX345, the Doro PhoneEasy 410, and the Nokia C3. It might not be the prettiest device, but it can get the job done. Above is the Nokia C3, the latest handset to hit Consumer Cellular. As you can see, it’s a full-QWERTY device, so it works well for the messaging freaks among Consumer’s ranks. It also features a 2-megapixel camera with video capture, a media player with up to 8GB in expandable memory, and a web browser. The device costs $80, but there is a $35 instant rebate, so it’s $45. But there is also a $35 activation fee, so it’s back up to $80. You can pick it up at Consumer Cellular’s website. It’s not often we get dish on Consumer Cellular, but yesterday we saw that they added the handset pictured above. It’s the most basic of basic handsets, though it does have a VGA camera and some form of media player. The handset is free after instant rebate, though it does require a $35 activation fee. You can get this at a retailer or at Consumer Cellular’s website. Will a touchscreen phone sell on a carrier that is mainly geared towards folks of an older generation? Consumer Cellular is going to find out. They’ve announced the release of the Samsung A697, a handset with a 3-inch touchscreen. 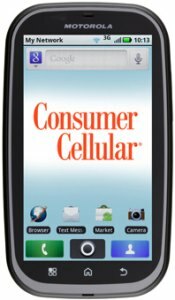 Other than a 2 megapixel camera there’s not much else to boast, though it seems Consumer Cellular is focusing on the user interface. At least the price is right: $60, plus $35 activation fee. If customers open a new line or open a new line on an existing account, they’re eligible to receive double their plan’s minutes for the first three months. That promotion runs through the end of the month. 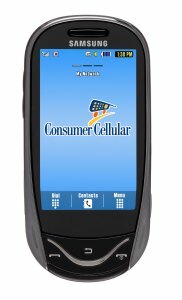 You can get that, and the A697 on Consumer Cellular’s website. Consumer Cellular has launched two new handsets, both of which cater to a more mature audience. The Doro PhoneEasy 410 and 345 feature large buttons, popular among the senior crowd, Bluetooth, and support for hearing aids. The 410, a flip phone, will cost $50, and the 345, a candybar, will cost $40. They are available at Consumer Cellular’s website.